These contemporary Elite Opula executive chairs’ black leather upholstery, fully upholstered high backs, headrests and ergonomic frames offer supreme comfort. They will definitely make an impact in your office. If you would like more information, you can get in touch with our sales team on 07944 508282 or use the Telephone Icon at the bottom right hand side of your screen. 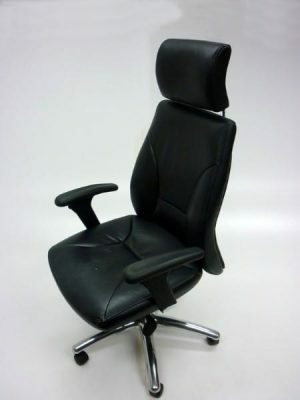 As always, these ergonomic chairs can be viewed in our showroom along with all our other used office furniture.